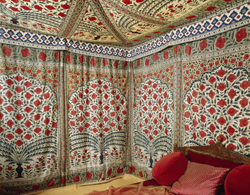 • A spectacular tent used by the Tipu Sultan, ruler of the 18th century Kingdom of Mysore (pictured), is among highlights in an exhibition exploring the “incomparably rich world” of handmade textiles from India which opens at the V&A in South Kensington on Saturday. Part of the V&A’s India Festival marking the 25th anniversary of the opening of the museum’s Nehru Gallery, The Fabric of India has exhibits ranging from the earliest known Indian textile fragments (dating from the 3rd century) through to contemporary fashions. Among the around 200 handmade objects – which include everything from ancient ceremonial banners and sacred temple hangings to modern saris and bandanna handkerchiefs – are a Hindu narrative cloth depicting avatars of Vishnu dating from about 1570, an 18th century crucifixion scene made for an Armenian Christian church in south-east India, block-printed ceremonial textiles from Gujarat – made in the 14th century for the Indonesian market, bed-hangings originally belonging to the Austrian Prince Eugene (1663-1736), and a selection of clothing made using Khadi, a cloth which Mahatma Gandhi promoted using in the 1930s when he asked people to make the fabric as a symbol of resistance to colonial rule. Admission charges apply. Runs until 10th January. For more see, www.vam.ac.uk/fabricofindia. PICTURE: © National Trust Images. • Westbury Road in Bounds Green, Haringey, is the subject of a new photographic and art exhibit which opened at the Geffrye Museum in Shoreditch this week. A Street Seen: The Residents of Westbury Road is a collaborative exhibition featuring the works of photographer Andrew Buurman and artist Gabriela Schutz as they document the homes, gardens and residents of what is described as a “typical London street”. The display includes a six metre long panoramic drawing of Victorian houses by Schutz and a series of photographs depicting residents in their back gardens taken over a two year period by Buurman. Runs until 3rd April. For more, see www.geffrye-museum.org.uk. • One of the founding fathers of sports medicine, Nobel Prize winner AV Hill, has been honoured with an English Heritage blue plaque unveiled at his former home in Highgate in London’s north last month. Hill, as well as being noted for his work in the field of physiology, was also an independent MP during World War II and a humanitarian who is credited with helping more than 900 academics – including 18 Nobel laureates – escape persecution by the Nazis. He lived at the property at 16 Bishopswood Road for 44 years, between 1923 and 1967, 10 years before his death. For more on blue plaques, see www.english-heritage.org.uk/visit/blue-plaques/.